Getting dark and this light appeared…….But from what I ask? ~ by jolli on February 11, 2010. Love it! You have a wonderful eye. Is it the moon rising and reflecting off of the roof of a house on the ridge, illuminating the smoke from the chimney, and also the light of the moon accross the lake or perhaps the same but fro the setting sun in the far south horizon? 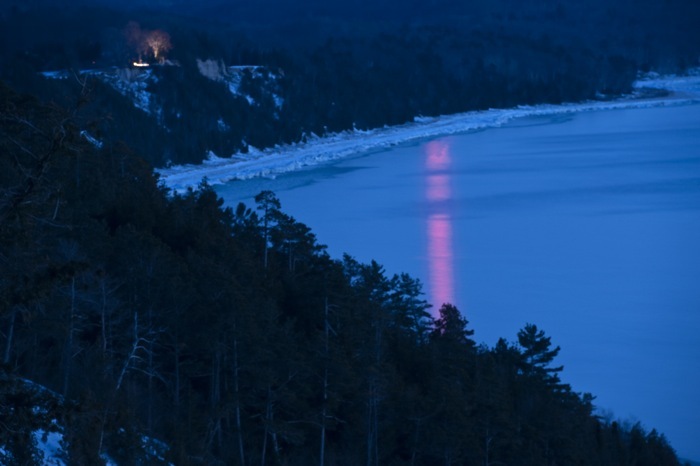 It was getting pretty dark and the mysterious red light kept getting brighter……I was on Whaleback looking south and the red lights on the tower on Schomberg caught my eye. It was a fun trip down the trail with no flashlight! This entry was posted on February 11, 2010 at 10:01 am and is filed under Local Area.You can follow any responses to this entry through the RSS 2.0 feed.You can leave a response, or trackback from your own site.